This weekend we made up a quadruple batch of what is the best enchilada recipe in the whole world. It is likely that I believe this due to the cream cheesy goodness of the filling. It was originally copied from one of my aunts (I don't know where she got it) and I've modified it a bit along the way. Below is the recipe for a single batch. They freeze really well although I do like to leave them out to thaw before baking them. I think that the cook time might get quite long otherwise. Sauce - Saute 1/2 c. chopped onion and 1/2 c. chopped green pepper in a little oil until softened. Add 15 oz. of tomato sauce, 1 c. chicken stock, 1 t. cumin, 2 t. chili powder, 1 t. salt, and 1 t. sugar. Simmer for 30 minutes. Filling - Soften 8oz. cream cheese (or neufchatel). Lightly saute 3/4 c. chopped onion until soft. Mix onion into cream cheese, add 1 t. salt and 2 1/2 c. cooked chicken. When this is well mixed, stir in 1 1/3 c. whole milk (or light cream). Assembling - Have 10-12 flour tortillas ready. Dip a tortilla in the sauce, coating both sides, and place it in a 9"x13" baking pan. Scoop about 1/2-3/4 cup of filling onto the tortilla, fold ends over, and roll. Place the finished enchilada seam side down in the pan. Repeat until all of the solid parts of the filling are used. I always seem to end up with about 2 or 3 more enchiladas than the pan can accomodate so I make a supplemental 8"x8" as well. Pour remaining filling liquid evenly over the enchiladas. 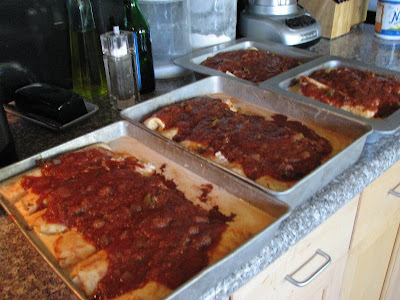 Pour remaining sauce evenly over the enchiladas. Sprinkle with about 1/2 c. cheddar cheese. Cover the pan with a metal lid or aluminum foil. This is the point where they can be frozen for later use. Baking - Preheat the oven to 350 degrees. Bake, covered, for 15-20 minutes. Remove cover and bake an additional 5 minutes. Also, I just discovered that cooking sushi rice and adding rice milk, sugar, vanilla, and dashes of cinnamon and cardamom makes about the most delicious rice pudding ever. The gluey sushi rice makes it all rich and creamy without having to add a bunch of cream.